Bright and new villa with private swimming pool, barbecue and outdoor dining area and balcony with sea view close to the famous Pernera beach perfect for families. This is a beautiful three bedroom villa with private pool set on a well maintained private development in Pernera 700 meters from Pernera beach with balcony with sea view. The villa has air conditioning in all rooms; it is open plan design with a fully equipped modern kitchen, two sofas in the lounge area, dining room suite to seat 6, two bathrooms upstairs plus a guest toilet downstairs. 1 of the bedrooms is with 2 single beds, and 2 bedrooms are with double beds, one of them is en-suite double bedroom. One of the bedrooms has access to the sunny balcony with sea view ideal to enjoy the beautiful Cyprus sunshine. The patio is with dining table for 6. 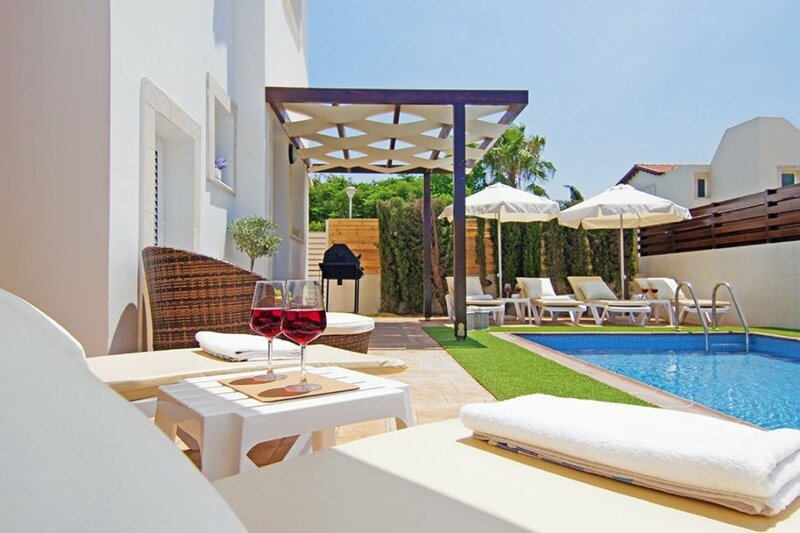 There are sunbeds and umbrella to lounge around the private pool. The villa is fully furnished and equipped with all modern appliances such as Wi-Fi, IPTV, DVD player, fridge/freezer, cooker, microwave, toaster, kettle, coffeemaker, and washing machine, dishwasher, ironing facilities, oven, extractor fan and all cooking utensils. The specious ground floor of the villa has an open plan setting with the kitchen, dining and lounge area well-spaced out for maximum comfort and convenience. The lounge area is tastefully furnished with sofas, a coffee table, DVD player and IPTV with films, news and children’s channels. The inside dining area can be used for anything from intimate dining to family meals, and can seat up to 6 people comfortably. A spacious living area that opens to a patio perfect for al-fresco dining, relaxation and soaking up the sun in a lovely private pool. Free swimming pool maintenance throughout your stay (twice a week). Free of charge Welcome Hamper provided upon arrival. NOTE 200 Euros security deposit is required payable cash on arrival before check in. To be returned on the check-out day if there are not any damages. An allowance of 200 kWh of electricity is allowed per week this is sufficient for normal use, any use over this will be charged as an addition and deducted from your security deposit. On arrival we will show you the electricity meter, you are welcome to take your readings on arrival and on exit. Then is Polyxenia Beach with a grassed area leading not only onto a lovely sandy beach but it also brings you to the beginning of the board walk into Protaras, passing coves of sandy beach every now and then. The walk should take about 20 minutes, depending on how fast you walk, how hot it is and how many bars and restaurants you stop in along the way. The villa is located in one of the most attractive resorts of Cyprus namely Protaras.